Bradbury, Ray. (1950). 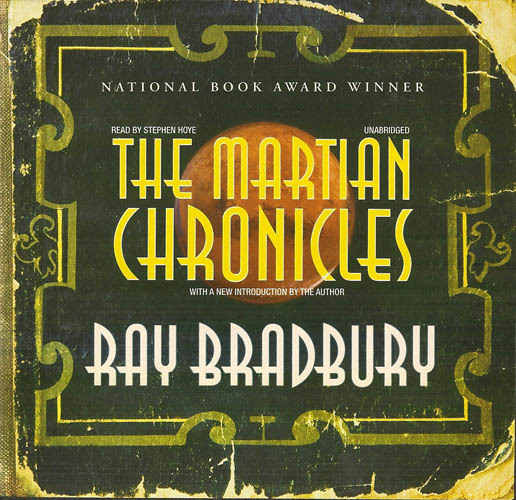 The Martian Chronicles. Bantam Books; Toronto. For the curious and creative reader, this Ray Bradbury novel is a loosely episodic collection of short stories woven together with vignettes; as such, it allows the reader to interpose their own conclusions onto the plot line (Wikipedia article). The stories describe the colonization of Mars, the conflicts between Martians and humans, and the legacy of a devastated Earth from which the humans are fleeing. Each story was originally written by Ray Bradbury in the late 1940s for inclusion in various science fiction magazines (Wikipedia article). Photo credit to SFFaudio 2014. “They had a house of crystal pillars on the planet Mars by the edge of an empty sea, and every morning you could see Mrs. K eating the golden fruits that grew from the crystal walls, or cleaning the house with handfuls of magnetic dust which, taking all dirt with it, blew away on the hot wind. Afternoons, when the fossil sea was warm and motionless, and the wine trees stood stiff in the yard, and the little distant Martian bone town was all enclosed, and no one drifted out their doors, you could see Mr. K himself in his room, reading from a metal book with raised hieroglyphs over which he brushed his hand, as one might play a harp” (Bradbury, 1950). The novel itself drew content and inspiration from multiple sources, such as Sherwood Anderson‘s Winesburg, Ohio (Wikipedia article). Each story serves as an episode within a larger narrative that is marked with two parallel catastrophes – the near-extinction of the Martian and the human race (Wikipedia article). This is similar to Isaac Asimov’s Foundation series, which uses a similar form of “future history” structure (Wikipedia article). If you want to enjoy a mentally-stimulating read that will make you look back on the future, I would strongly recommend this excellent novel of stories!